We received an absolutely gorgeous Wooden Fairytale Tea Set to review from Lucy Locket. The tea set includes 12 pieces, 2 are gorgeous glittery cakes! I opened the outer packaging & the pink tissue paper wrapped around the box peaked Izzy’s interested immediately. Izzy was so excited when I told her she could open it. Izzy unwrapped the wooden tea set, each piece carefully wrapped in paper to keep it safe. Each piece is carefully hand painted with beautiful fairies, magical creatures & flowers with a touch of glitter. I absolutely love the designs, especially the tray and Teapot! After unwrapping all the pieces, Izzy got to work setting up the tea set, placing cups on saucers etc. Even Izzy pointed out the beautiful fairy designs and ‘sparkle’ as she busied herself. A cup of tea was poured for me & a cup of coffee for her daddy whilst keeping the cake closely guarded next to her haha! Izzy loves playing with the tea set and spends a good half an hour repeatedly pouring teas & coffees whilst explaining what she is doing. Eva & Izzy both enjoy having tea parties together so Izzy couldn’t wait for Eva to come home & play too. When Eva got home both girls decided they needed to dress up as princesses & have a tea party. They both took turns pouring tea & milk & then stirring their cups of tea, happily talking as they went. Eva told anyone and everyone all about the Fairytale Tea Set the next day! I am really impressed with the quality of the tea set, the wood is thick & strong and so beautifully decorated that any little one would love this Fairytale Tea Set. At just £24 with free post & packaging (on orders over £20) this gorgeous Wooden Fairytale Tea Set would make the perfect gift! Lucy Locket offer a range of stunning dress up costumes and wooden toys. Perfect for encouraging kids to use their imaginations through pretend play. Izzy loves Cbeebies and was ecstatic to receive a copy of the magazine for us to take a look at together. 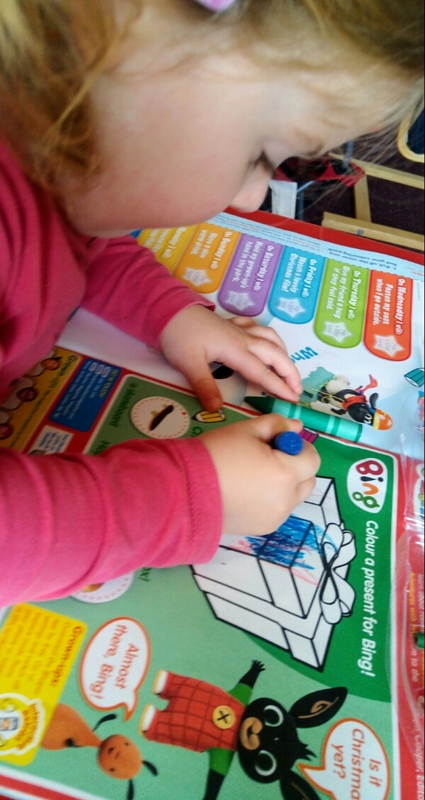 We received the big colouring pack edition which was an added bonus for Izzy as she absolutely loves colouring! She was really excited about having her own special crayons, pens & felt tips and couldn’t wait to get them off and open the magazine. Of course she was more than happy to pose and show off her magazine first. 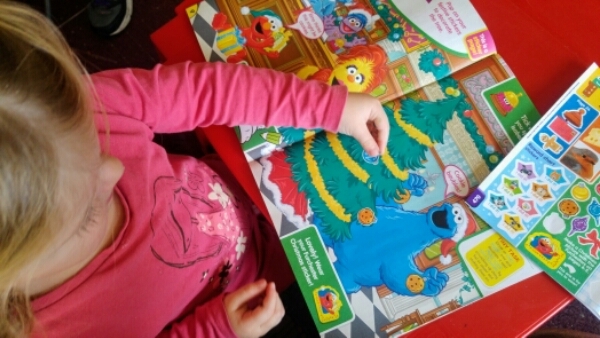 Izzy flicked through the pages and was so happy to see almost every page had something to colour in! She went back to the first page to colour Bing a present. Bing is her FAVOURITE character on Cbeebies and she loves flop too so she tried so hard to stay in the lines.. Not too bad for a 2 year old! We were both really pleased with her efforts and there was plenty of praise for her. 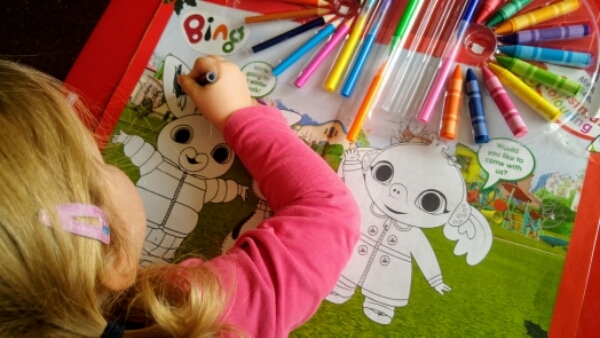 Of course we then had to colour in the big Bing picture too. Izzy decided Mummy had to join in aswell.. Although as always she had to be a little bit awkward so this time she was wayyyy over the lines but we had fun. 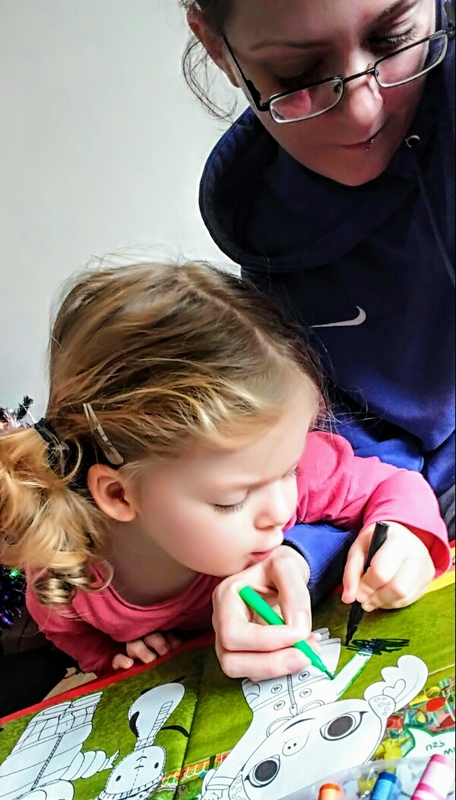 Check us out concentrating really hard on our colouring! Next we moved on to some of the activities like this Topsy and Tim one. Although she can’t quite write yet Iread Izzy the questions. She was really pleased to get them right and add the relevant stickers too. The activities throughout the magazine were really fun and even at Izzy’s age the activities are doable with a little extra help. 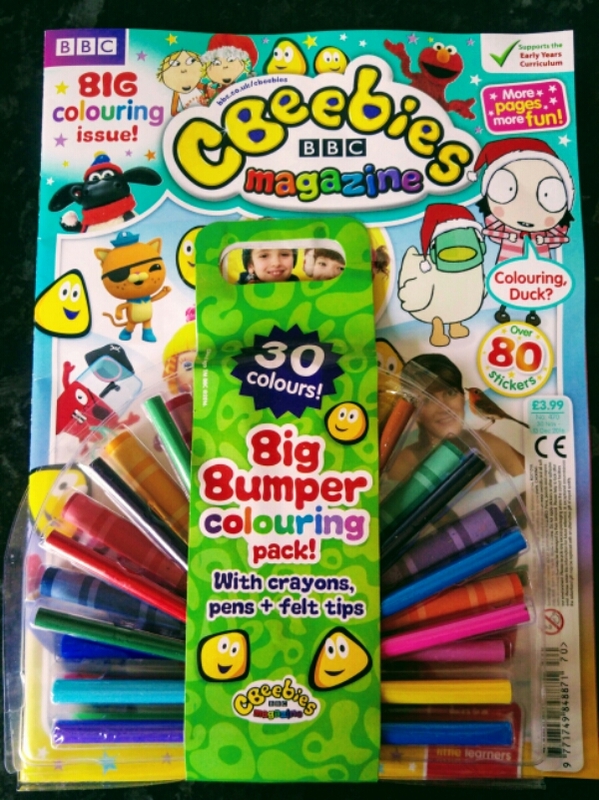 This magazine is brilliant for improving fine motor skills with colouring and sticking amongst other things. There’s a brilliant Peter Rabbit workbook in the middle which Izzy decided to colour in but would have been great for a slightly older child. I do enjoy buying magazines Izzy will actually enjoy with lots of activities too so I’ll definitely buy it in future for her. Izzy absolutely loved The Furchester Hotel activity though. Finding Isabel and decorating the Christmas tree with stickers. 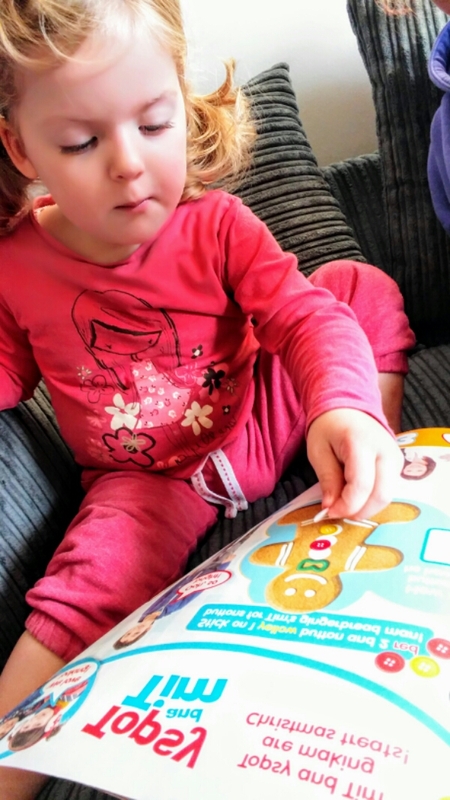 It’s always lovely to see a toddler having fun and concentrating at the same time! The Cbeebies magazine gave me and Izzy something to sit down and do together during a very hectic month. I have to say it’s been a great distraction for both of us. Magazines are usually a rare treat as generally they don’t have much in them. The girls are usually bored in minutes in all honesty. However Izzy has spent a few days colouring in some more and getting Eva to read the stories to her. I’ll be buying the next issue for to keep us busy on days Eva is at school. You can buy a Cbeebies Magazine too in your local newsagents & supermarkets. *I received this item in return for my honest review. I received a Grey Hobby Pack by Holster brands which you can buy HERE recently to try out and review and I have to admit I absolutely love them! They have been so handy when I’m crafting and so easy to use too. I love how they can be moved about to where you want too. 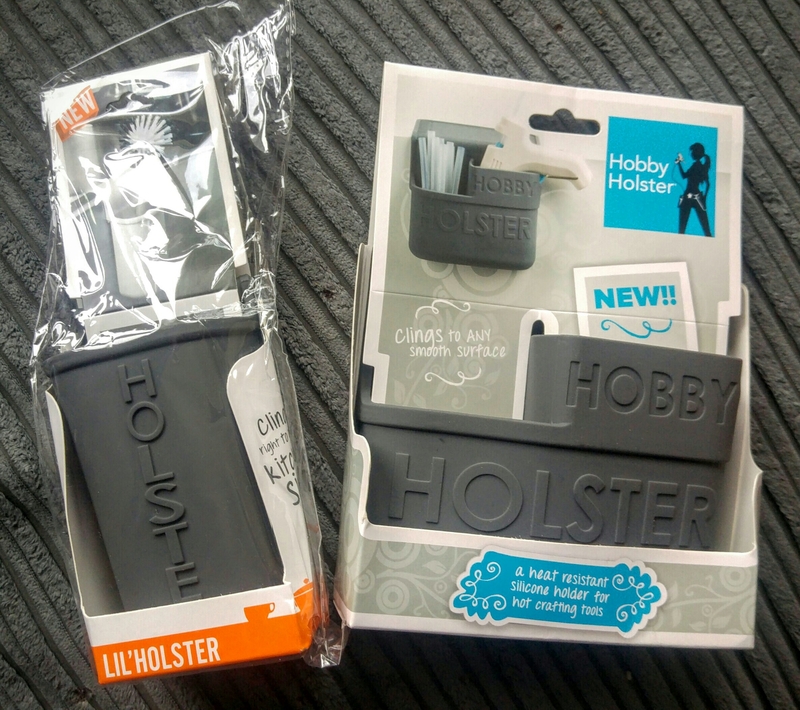 I received the Lil’ Holster & Hobby Holster in exchange for my honest review and I am really impressed! They come in a range of colours and I received these grey ones which is actually my second favourite colour and I am little obsessed with using them on my kitchen worktop whilst I do things like drawing. 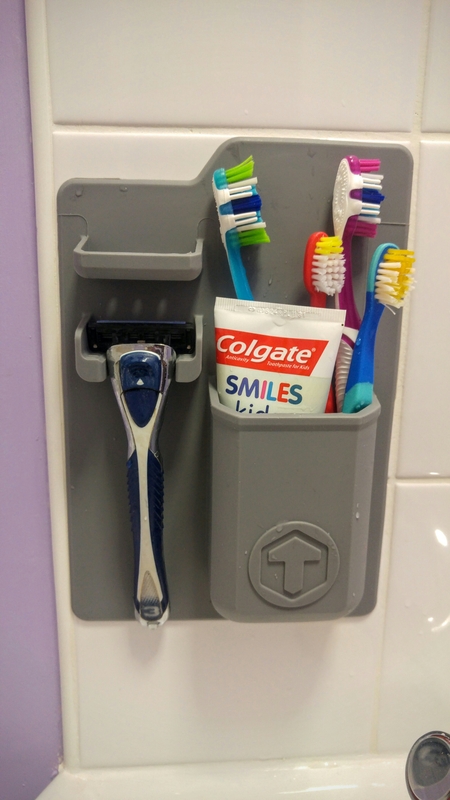 They are basically handy little silicone pockets you can hang off of ANY smooth surface as long as it is clean and dry. The Lil’ Holster has draining holes in the bottom so it can be used by the sink I love using the Lil’ Holster for holding my Posca Pen’s I’ve recently won to stop tiny hand’s getting hold of them (again) whilst I’m drawing. You could literally use it for anything though.. I also found it quite handy to pop my glasses in at night as I often knock my glasses to the floor & struggle to find them haha! 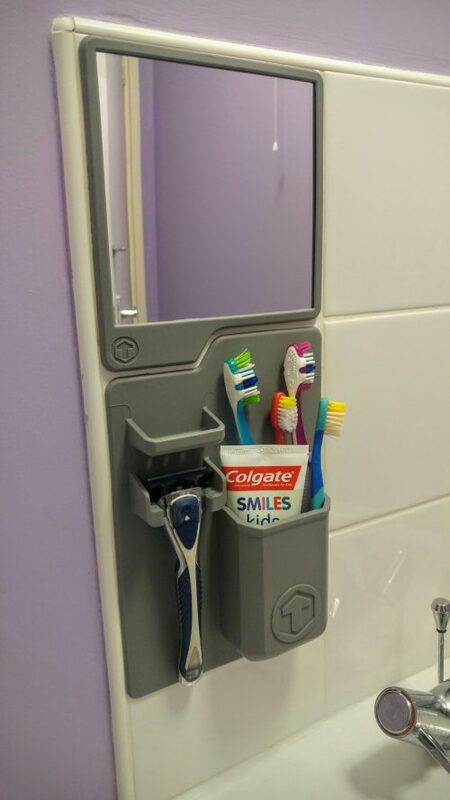 They are so easy to use just lift the flap (they come folded) make sure the surface your using is clean and dry and press it down and your good to go! If your having trouble getting yours to stick simply wash it with soapy water and let it dry completely to remove the dust and dirt preventing it from sticking. They are dishwasher safe too! (Upto 120°c) Once they are stuck down it’s fine to get them wet, they still stay in place! The larger Hobby Holster is amazing for crafting. Although I don’t have one (yet) they are ideal for holding hot glue guns as they are heat resistant up to 200°c! It also has a built in ruler which has been pretty handy with some of my crocheting recently as I can measure my stitches. We also used it to measure my brother’s coat rack as we had measured wrong to begin with and couldn’t find a ruler but needed to cut it down a bit! Trying out the Lil’ holster and the Hobby Holster has been brilliant! If you have a small desk & need somewhere for pens, stapler’s etc in. It’s handy for holding crochet hooks/knitting needles in too, these Hobby Holster’s really are handy little things! How would you use your Holster? When I saw the opportunity for the #MamiasDaysOut on the @britmums website I signed up and crossed my fingers. I was pleasantly surprised when this amazing hamper showed up a few days later. 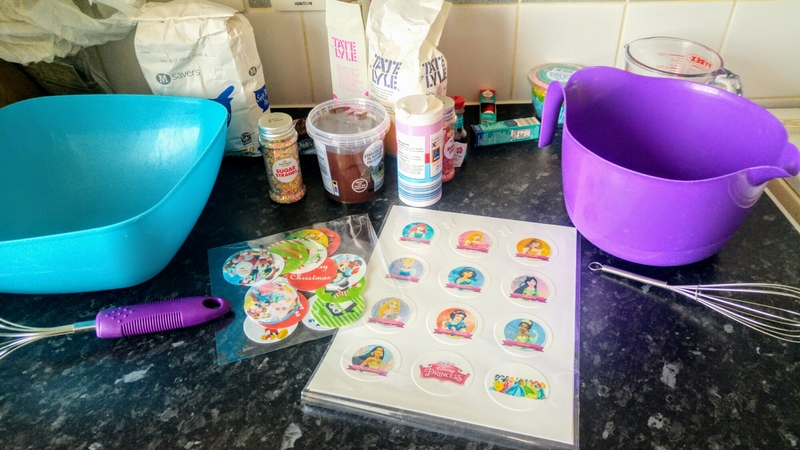 I am a great fan of Aldi Mamia products having tried a lot of different products with both my girls. Aldi Mamia has proven to be the best for us time and time again. Good quality and value and 100% organic, what’s not to love? £5 Aldi Voucher to spend on Mamia Nappies & wipes. We have used Aldi a lot more since Izzy was born, it’s only a 10 minute walk from ours. I love the quality of their nappies and they are such brilliant value! I love that I can get 2 packs of size 6 Mamia nappies and a 4pack of wipes for less than £10. I was spending double that with Eva just on nappies alone! I decided to spend the £5 voucher on the Mamia easy-pants as Izzy is showing an interest in using the potty and toilet recently. At only £1.85 for a pack of 16 you really cant go wrong! Izzy absolutely loves them and finds them much easier to pull up and down than other brands we have tried. I also bought my usual 4 pack of Mamia sensitive fragrance free baby wipes as the girls & I have quite sensitive skin and suffer Eczema. These wipes are so soft and gentle on your skin and for 59p per pack or 2.39 for 4 packs you just cant beat them. We decided to give the Mamia Fabric Softener a try as we hadn’t noticed it before & for a 40 wash bottle at 99p it beats the current deals we’ve been picking up elsewhere! 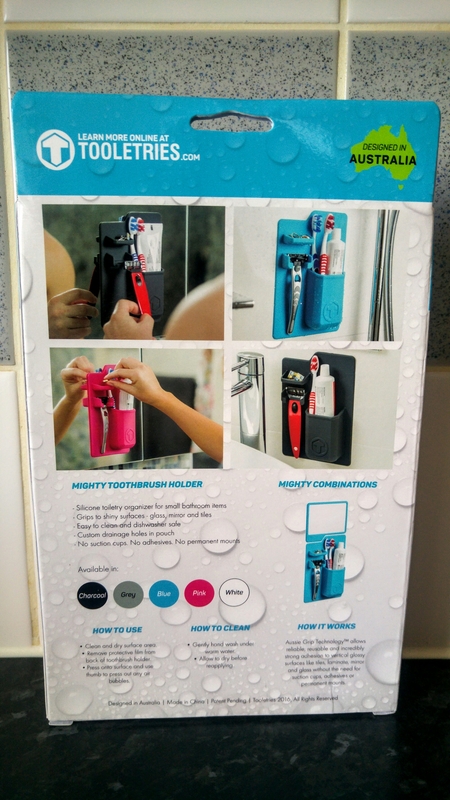 We gave it a go and I am pretty impressed as it’s left our towels lovely and soft & all the girls clothes are coming out softer too and we haven’t had a problem with skin irritation which limits what we can use quite a bit! I think it’s safe to say we will be sticking with the fabric softener too! When I recieved our hamper Izzy spotted the rice cakes which are one of the few products from their Mamia food range that she hasn’t tried yet. She sneakily grabbed the pack of Apple Mini Rice Cakes and got munching. She did share them with Eva too who said they were delicious. Izzy has loved the Mamia Apple and Pear pot’s since she was around 4/5 months old. I haven’t bought them in a while, yet Izzy couldn’t wait to get stuck in again and demanded a pot when she saw them in the cupboard a few days later. How pleased does she look to have gotten her own way!? Although I haven’t managed to snap any pictures as I haven’t gone with them, Izzy has been demolishing the Mamia Puree pouches whilst whizzing about town on her trike with daddy! She still loves all the different flavours but Apple & Banana is still her favourite and lasts about 5 seconds flat! She absolutely loved it all but after all the excitement she was very hungry & made me stop halfway home for a snack. Luckily I had taken the Mamia raspberry rice cakes and organic juice with us so Izzy sat on a bench & had a quick munch & a juice when she eventually let go of the bottle! She wasn’t too impressed with the wind & really didn’t want to let go of the bottle! 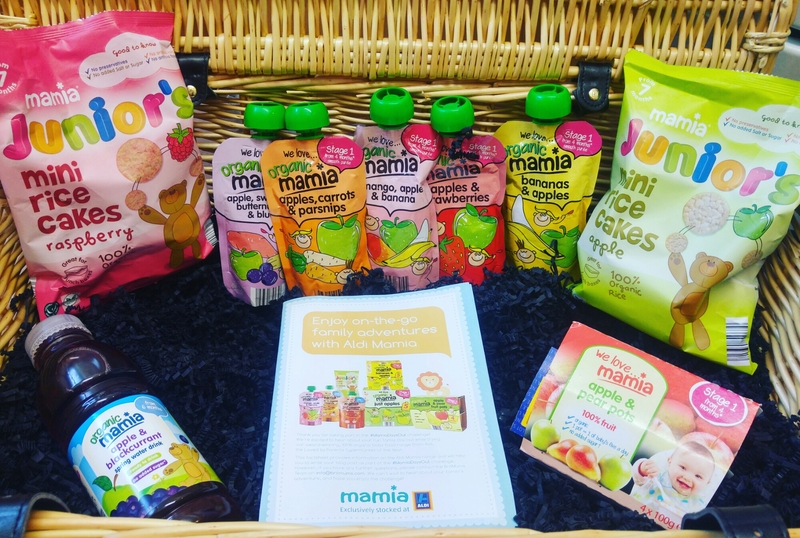 We absolutely love the Aldi Mamia range and would definitely recommend it to anyone with a little one. Whether it’s the nappies, wipes, food or juices it is well worth a try. They have so many healthy food options & are so handy on the go! Mamia makes parenting that little bit easier and cheaper too! This week we recieved a bottle of Hellman’s American Smokey Barbecue sauce to try from Bzzagent! We love Barbecue sauces so couldn’t wait to give it a go, the girl’s decided they had to try it first with their dinner & gave it a thumbs up instantly with both girls demolishing all of their dinner and Izzy attempting to lick all the sauce off her plate haha! I gave it a quick taste when the girls had dinner and was surprised there wasn’t a really strong tangy after taste. I find a lot of barbecue sauces I have to have small amounts of due to being quite tangy so it made a lovely change having such a lovely smooth flavour. We ended up making new york style chips (bacon, cheese & bbq sauce) for our own dinner and it was lovely. I can definitely see us buying more of this sauce in the future! I’m absolutely gutted over the death of the LGG4, my beloved phone I won! A little while ago I mentioned I had tested the LGG4 for TheInsider’s & was lucky enough to keep the phone which honestly i was delighted with as it was a great phone, amazing camera & so easy to use. However, on Tuesday morning I got up, used the phone as normal & left it on the side whilst I nipped to the toilet. When I came back the LG loading screen had appeared & I figured it had restarted itself. I took the battery out for a few minutes and popped it in again in the hope it had just got a bit warm or something. Unfortunately the phone just would not go past the loading screen & just wouldn’t load the android operating system at all. After stressing myself out trying to do soft & hard reset’s and not even being able to get into the bootloader myself, I handed it over to Rich, our go to guy for any tech problem. After quite a few attempt’s he finally managed to attempt the reset’s but each time the phone would begin restarting again without loading the android system & he believes the system has been corrupted as it kept trying to load & update then restart. After 3 day’s of trying to even get the phone to load & not being able to retrieve any of my data I finally gave up and admitted defeat. I am gutted though If I am honest as there is no way I can afford to replace it at all it was a £500 phone!!! I was so lucky to win it but I am so damn unlucky to have lost everything that I have lost from it. I gave my old phone to my brother as he had no money & needed a new one badly to stay in contact so unfortunately I had no back up phone. Luckily Rich had an older phone I can borrow until I can sort out a new phone some how but it mean’s I’m not going to be online as much as web pages take months to load on the phone I have borrowed. I am gutted as I’m now so behind with blogging & I’ve just spent the last 3 days going out of my mind panicking because I can’t be contacted by anyone or contact anyone else if something goes wrong especially as the Mr managed to lose my bank card & it took us a few day’s to sort paying the internet bill so I couldn’t even talk to anyone online either. I’m sure anyone with anxiety can understand just how awful I have felt the last few days especially with Eva in school & trying to help my brother a few miles down the road, being out & knowing you can’t be contacted if there’s an emergency with your kids is absolutely terrifying! Then to add to it all when I’m home I feel trapped unable to call out or talk to anyone high up on the 11th floor & not knowing many people around us makes it worse. I have contacted TheInsiders & LG this morning in the hope something can done but I have very little hope. I have to say the phone whilst working was an absolutely amazing phone but the fact this has happened with no damage, no dodgy download’s etc I definitely won’t be attempting to get an LGG4 again as I have lost so many photo’s, note’s, documents etc as I hardly thought the phone would die after just 8 months. Considering my last 2 phone’s were a HTC one X and a HTC wildfire which both lasted 2 1/2 year’s before selling on with plenty of life left I think when I can afford it I will be going back to a HTC phone of some sort. If anyone has any phone recommendations please let me know, I will be attempting to scrape together £100 for a second hand phone in the next few months and want something that I can use for blogging & social media with a decent camera. Feel free to share any product reviews in the comments!